Ogunquit, Maine is a beautiful oceanside village about 30 minutes north of Dockside Guest Quarters. There are so many things to do in Ogunquit: visit Ogunquit beach, enjoy a show at the Ogunquit playhouse, and enjoy some great dining opportunities. There are many delicious places to eat in the area, so here are the 5 best restaurants in Ogunquit to enjoy. Bread and Roses Bakery is one of the many great restaurants in Ogunquit. They bake using only the freshest ingredients with their own unique recipes. Bread and Roses has fresh Carpe Diem coffee and made-to-order drinks along with smoothies, muffins, scones and other pastries. Also try other lunch and breakfast items like quiche, Panini’s, burritos, and the thin crust pizza. Five-O Shore Road serves excellent food with a good atmosphere. The menu changes seasonally and Five-O Shore Road has a delicious Sunday brunch that makes it one of the top Ogunquit restaurants. This summer try local seafood selections along with dishes like linguini with crab, pan roasted free range chicken, clam chowder and many other delicious selections. Angelina’s Ristorante is a delicious Italian restaurant that serves authentic Italian fare with local meats, produce and fish. Enjoy your meal in the main dining room, lounge, garden terrace or wine room. With one of the best wine selections among the restaurants in Ogunquit, there are several different wines to choose from include by the glass and the bottle. Voted the best Italian restaurant in Ogunquit, reservations are required before you head to dinner by calling 207-646-0445. 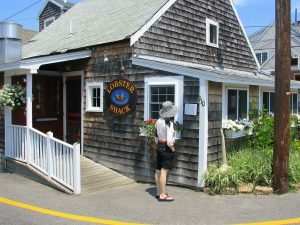 The Lobster Shack is one of the most popular lobster restaurants in Ogunquit. Family owned and operated since the 1980’s, the Lobster Shack offers a rustic setting combined with delicious lobster that will complete your Maine experience, especially in Maine lobster season. Dine on lobster rolls, lobster, clam chowder used with seafood that is brought in fresh by local fishermen. Make sure to try the clam chowder which is one of the favorites! If you’re looking for one of the best breakfast restaurants in Ogunquit, look no further than Amore Breakfast. Using a unique menu, Amore Breakfast has a nostalgic atmosphere and friendly service that will help you feel like family. Try the house specialty of bananas Foster French toast with pecan-coated cream cheese stuffing. This is one restaurant in Ogunquit that you won’t want to miss! There are many delicious restaurants in Ogunquit so make sure to book a stay at Dockside Guest Quarters so you can travel north to enjoy them. Not only do the accommodations offer timeless style combined with modern comforts, but when you stay you also get breakfast from our bountiful buffet each morning, ensuring that your days will start off on the right note. Our Dockside Restaurant is perfect for a great meal. For an all-around good time in coastal Maine, stay at Dockside Guest Quarters. We can’t wait to see you soon!